The Sixers will be without Jimmy Butler for Monday's game against the Houston Rockets, but from the sound of things, he shouldn't be expected to miss much time. According to a team representative, Butler began to complain of discomfort in his right wrist on Saturday evening, shortly after the team suffered a 117-115 loss to the Oklahoma City Thunder. 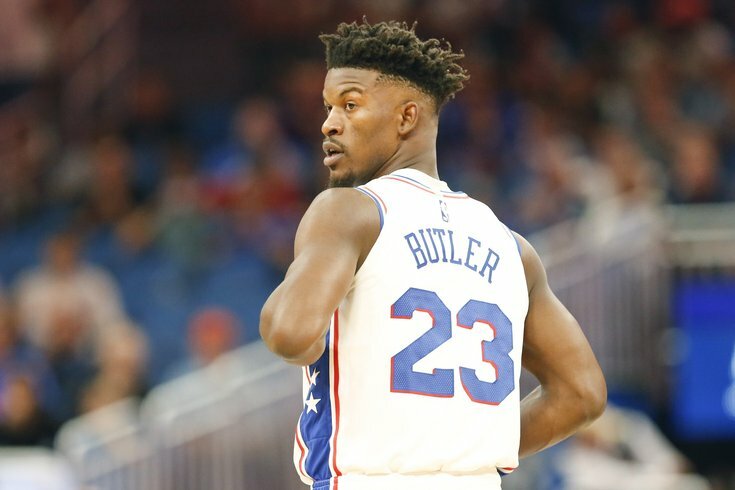 Butler has since received treatment on the wrist, PhillyVoice was told, and is preemptively considered questionable for Wednesday's game against the San Antonio Spurs. With the Sixers up against the current MVP frontrunner on Monday evening, Butler's absence was a particularly notable topic of conversation during Brett Brown's pregame session with the media. James Harden is in town, and with the reigning MVP dropping 50-point games seemingly at will, the immediate reaction is to worry about what's right in front of you. Of more concern to Brown is the long-term, and the coach doesn't sound all that concerned about Butler's ailment. "I don't really have an idea of what to expect with Jimmy," said Brown. But, he added, "It isn't something that we are or he is worried about, in the sense of, 'This is a lingering or long-term type thing.'" In steps Corey Brewer, who appeared in garbage time against the Minnesota Timberwolves but has not featured in either of Philadelphia's last two games. Brown revealed he would start against the Rockets on Monday night, and recalled simpler times during the Process era, when he would ask players to step in off the street and start. "Tim Frazier would come in and you'd shake his hand and say nice to meet you, you're the starting point guard," said Brown before the game. "Corey's been with me now for what, five days, four days, whatever it is, and you say welcome to the team, you have James Harden, you're starting tonight." Not the kindest assignment to get handed in your first start of the year. The decision to bring in Brewer, rather than reincorporating Furkan Korkmaz or bumping up one of the current members of the rotation, is interesting, to say the least. If you're looking for some entertainment at the end of what was likely an off day for most of you, Harden is going to pile up points like they're going out of style without Butler available to help on defense. And if Joel Embiid ends up being ruled out because of the sore back that has hindered him over the last week, you might even get to see a historic performance. See, there's a silver lining to everything.